I have been back to my Dear Jane blocks. I got a little hand applique done this week and completed three Purple blocks. I have four other blocks partly done and needing some hand stitching. I will soon have half the purple blocks done. It will look like a good start to a quilt. I have added this post to Kathy's Slow Stitching Sunday. She was talking about what she watches or listens to well stitching. I have a few different tastes. I will watch Game of Throwns then Mad Men tonight and stitch. I sometimes watch CBC new channel or I listen to very bouncy and loud radio that is kind like dance pop or old hard Rock. But I also love super quite and no TV or noise on. I bought a little spring colour the other day. I had one last year and it lasted for months so thought it was a good deal. Now to just make sure it gets enough water. I do better with low water plants. always love seeing Dear Jane quilts! I wish I enjoyed piecing small blocks. 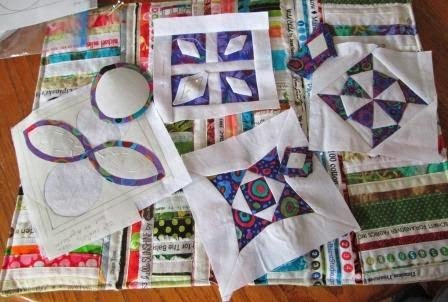 Dear Jane's are such beautiful quilts. 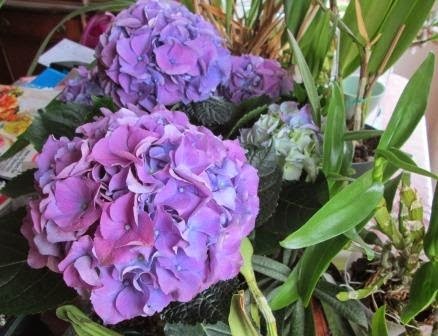 Don't you just love the color in those hydrangeas. I am hoping the winter freeze isn't going to keep my from blooming this year in the landscape. I look forward to them every summer. What great progress you are making on your Jane! So very pretty! Love your happy fabric choices. Yep, I do better with low-water plants too Cathy LOL!!! Your new plant has such lovely color :) You made good progress on your DJ blocks - gorgeous fabrics!!! 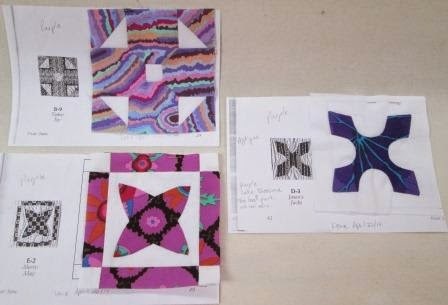 Beautiful purple blocks... enjoy your slow stitching!